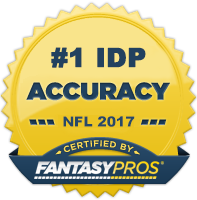 Hello and welcome to the third part of a three part series covering IDP average draft positions (ADPs). This specific article will focus on examining the ADPs of defensive backs. My own personal drafting philosophy is heavily predicated on finding as much value as I can with each and every pick. Typically the later in drafts you delve, the more value there is to be found and finding this value is what separates the winners from the losers in fantasy football. In this article, I will be comparing the ADP of defensive backs (provided by FFToolbox via MFL) to my dynasty rankings for defensive backs . I choose dynasty rankings over redraft rankings because it seemed the ADPs were more heavily tied to dynasty leagues as opposed to redraft leagues. The break off point in determining whether a safety was "undervalued" or "overvalued" was +/-11 points. The break off point for cornerbacks was +15/-30 since many leagues require you to roster a CB and therfore their ADP may be quite high when compared to may rankings which do not factor this in. When taking a general overview of the results, these specific numbers seemed to signal the start of the outlying players. Although these numbers were chosen arbitrarily, it will suffice for our purposes in this article and should allow for some accurate estimates of true value. For each player that was over these thresholds, I wrote a short analysis to sum up why they are either under or over valued. I hope this helps my readers get a better grasp on where defensive backs should be taken in most leagues and that it will ultimately take you one step closer to your league championship. 1. SS Kenny Phillips (+19) - Phillips is a guy that could put up Gibril Wilson (circa 2005) numbers. Both safety positions in New York have proven to be fantasy viable over the last few seasons and Phillips is a very solid player when healthy. Obviously, the main question with Phillips is how will his knees hold up. KP is perhaps the biggest risk/reward safety this year. 2. SS Quintin Mikell (+16) - Mikell has been quite consistent over the last three seasons and I don't expect that trend to stop this season. He should provide top 30 numbers. He's going at DB39. 3. SS Bob Sanders (+12) - Bob Sanderklaus is a top 25 DB when healthy (with top 15 upside). The problem is he has never played a full 16 game season. However, at his current ADP (43), the reward is just too good to pass up. I would have no problem taking Sanders in the 30-35 range. 4. FS Antrel Rolle (+11) - I'm quite high on Rolle this season. I think the move to New York will improve his fantasy numbers. He's a solid tackler and good enough in coverage to give you some big plays as well. This position has produced decent results with mediocre talent, so I think Rolle should be able to put up DB2-type numbers. 1. RCB Charles Tillman (+17) - "Peanut" has been one of my favorite defensive players since he entered the league in 2003. I did downgrade his ranking a bit since he is coming off an injury and moving to the right side of the field where there is typically less action. However, Tillman isn't as old as he seems. He's only 29 and plays in aggressive scheme that allows him to come up and make tackles. He's earned the right to be a top 25 fantasy DB. 2. LCB Antoine Winfield (+16) - Winfield, along with Ronde Barber, has been the most consistent fantasy CB over the last few seasons. When healthy, Winfield is usually good for 75-80 solo tackles with a few big plays. I know he's getting old, but we have still yet to see a serious drop-off is playing ability. He's good value at DB28. 1. FS Darren Sharper (-21) - I've never been a big fan of Sharper's as far as fantasy football goes. He doesn't produce many tackles (even for a free safety) and he instead relies on big plays to generate points. This style of scoring is just too inconsistent on a weekly basis for my taste. His age concerns me as well. 2. FS Earl Thomas (-21) - Thomas is one of the more talented players to come out of the draft and fantasy owners are likely taking up at his current ADP because of this hype. This is a mistake. He is a superb talent in a not so superb fantasy situation. Seattle plays a lot of cover-2 and free safeties behind solid OLBs struggle to put up good tackle numbers. Thomas may sprinkle in some big plays here and there but he's not going to live up to his current ADP. 3. FS Tanard Jackson (-14) - Jackson filled in nicely for the injured Jermaine Phillips last season. However, similar to Earl Thomas' situation, Jackson may struggle to put up consistent tackle numbers due to his role within the Bucs defensive scheme. On the flip side, he did have 5 INTs in limited action and may be valuable in that regard. 1. LCB Dominique Rodgers-Cromartie (-40) - Even in CB-required leagues, DRC's current ADP is way too high. He's had a decent amount of big plays in his first two seasons in the league. However, teams often throw away from him and his tackle numbers reflect this. Not a guy I would be too excited to have on my fantasy roster. 2. RCB Terrell Thomas (-38) - Thomas had a very nice 2009 season. He had 70 solo tackles and 5 INTs. I'm just very skeptical that he could continue to put up these type of numbers. The Giants secondary was in shambles last season and Thomas had a lot of tackle opportunities. I think he will see a significant decrease in both tackle and INT opportunities this season. 3. RCB Antonio Cromartie (-30) - Am I missing something with this guy? He hasn't done much of anything fantasy-wise for the last two seasons. Even with Revis playing on the other side, teams aren't going to throw a ton at Cromartie. He's not a great tackler anyways. I wouldn't want him.